Product prices and availability are accurate as of 2019-04-16 04:16:14 UTC and are subject to change. Any price and availability information displayed on http://www.amazon.com/ at the time of purchase will apply to the purchase of this product. *Easy Installation : Perfect for your home, office or any warm room with a sliding window. First, connect the vent hose to the back of the unit. Then remove the cap from the window vent kit. Finally, connect it to the exhaust hose. No permanent installation necessary. *4 Operational Modes : Cool- powerful 10,000BTU for 350 square foot space Dehumidify- remove moisture up to 56 pints per day Fan- Three (3) speeds. *Auto Restart Function: This function enables the unit to store your last used setting, it will automatically restart on the previous settings after a power outage. *Self-Evaporative System: Minimum manual draining. This unit is equipped with an auto-drain system that exhausts warm air and most moisture outside through the vent hose. *User-Friendly Control Panel and Remote, Three (3) Fan Speeds & 24-hour Programmable Timer: Both the control panel and remote are clearly labeled with buttons and LED display to show current operation status and temperature. The three (3) adjustable fan speeds - High, Medium and Low, allow you to choose the desired cooling preferences. Set the 24-hour programmable timer to turn the unit's power on and off at your preferred schedule. 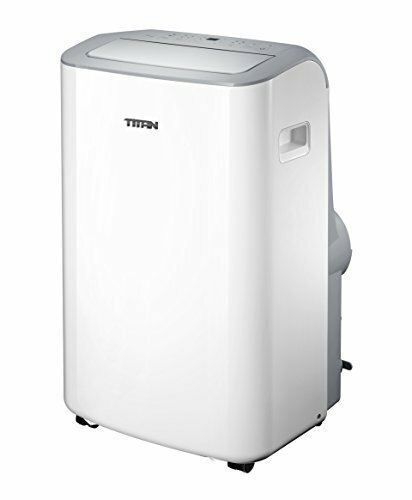 *Eco-Friendly & Energy Efficient: Titan's TT-ACP10C01 portable air conditioner uses eco-friendly CFC free, lead free, non ozone-damaging R410A refrigerant and is made with all RoHS compliant components that are free of harmful chemicals. With an amazing Energy Efficient Ratio of 8.9, this unit consumes less energy than others in its class. Four (4) individual operational modes : Auto,Cool,Dehumidify and Fan. Fan comes with three (3) adjustable speeds. For indoor space up to 350 sq. ft. Easy, non-permanent installation. 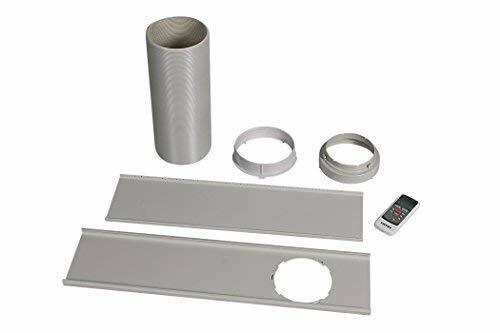 Remote control, extendable exhaust hose (4.9ft), and plastic window kit (27-48") included Adjustable temperature (62 - 88°F), 24-hour programmable timer,56 pints per day max. dehumidifying capacity. Power supply 115V/60Hz, power cord length 7.5ft, plug type LCDI, refrigerant type R410A. UL listed.